OMG, I am the kid in the candy store. “They are everywhere, they are everywhere”. I want to “capture this one with my camera…..I NEED to capture that one”. As I complete my 360 degree turn in Venice’s Piazza San Marco, I realize like the lagoon waves, they just keep on coming. 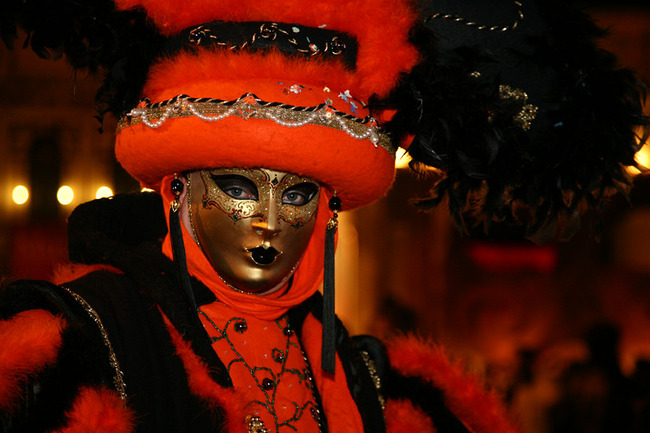 THEY being the costumed model participants of the annually “Carnival” of Venice. Starting at mid morning and running until late into the evening, colors of every hue and saturation excites my eyes. Venues galore, my challenge is to pick ONLY one place to be at a time. Geeeeeeez…..this is just not fair! My daylight gives way to the night light. Now, a completely different view of the ever changing ubiquitous models. Some night colors simply pop. “Lady of the Night”, this “Lady in Red ” is one of my favorite shots. I do not know if this model was a member of a troupe from Paris, Berlin, London, or wherever. All were so equally gracious and accommodating to the photographer. Eye candy? You betcha’, and lots of it. Michael Wiggins is a recently retired airline pilot. Having flown for Delta Air Lines for almost 30 years, he developed a love of photography while flying to international destinations and continue to travel to the world capturing images to share with others. He currently reside in Texas with my wife, Gail, and three dogs.